VISALIA – The Visalia Mall will be a lot emptier in the coming weeks as national retailers continue to falter. In the last two weeks, three national retailers with locations in the Visalia Mall have declared bankruptcy – Payless, Things Remembered, and Charlotte Russe. The news may seem devastating to the mall, but general manager Richard Feder said he sees the closures as an opportunity to make way for emerging retailers looking for space in a growing Central Valley market. 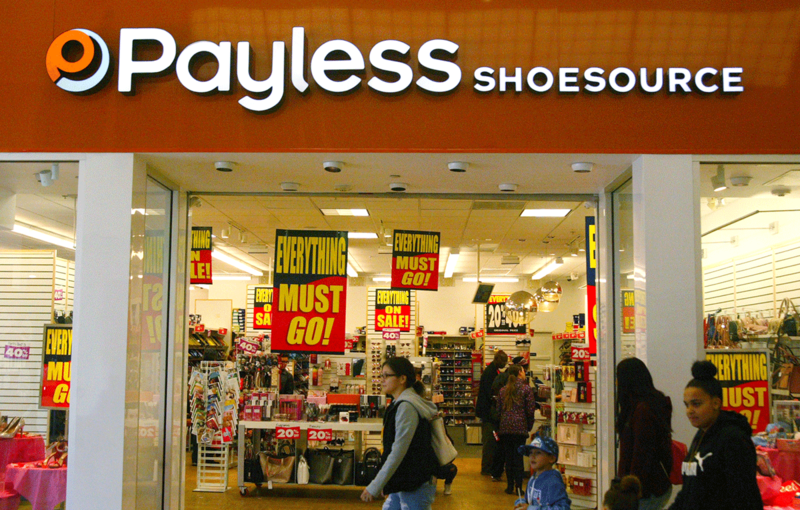 Payless ShoeSource announced on Feb. 18 that it had filed for bankruptcy and will close down all 2,500 of its stores and cease its online sales in North America. The discount shoe company expects store closings will begin at the end of March and many stores will remain open through the end of May, as it conducts liquidation sales in the U.S. and Canada. Stephen Marotta, who was appointed as Chief Restructuring Officer of Payless last month, said the 62-year-old company could not escape the crushing debt it accumulated when it first filed for bankruptcy in April 2017 despite closing 700 stores and cutting its debt by $435 million. Payless has petitioned the court to allow its stores to continue honoring customer gift cards and store credit until March 11, 2019, and returns and exchanges of applicable non-final sale purchases made prior to February 17, 2019, until March 1, 2019. A similar request will be made in the Canadian Court. The company has already discontinued its rewards programs and outstanding merchandise coupons in North America. Payless’ retail operations outside of North America, including its company-owned stores in Latin America, are not included in the bankruptcy filings. Payless’ 420 stores across 20 countries in Latin America, its stores in the U.S. Virgin Islands, Guam and Saipan, and its 370 international franchisee stores in 16 countries across the Middle East, India, Indonesia, Indochina, Philippines and Africa, will continue operating business as usual in every respect. Things Remembered, Inc. filed for bankruptcy on Feb. 6 to facilitate its sale to another retailer. Unfortunately for the Visalia Mall, the buyer, Enesco, LLC, is only interested in operating the online, direct mail, and B2B retail operations of Things Remembered, which specializes in personalized gifts and merchandise. Enesco is a global distributor of giftware, home décor, and accessories to a wide variety of specialty card and gift retailers, home décor boutiques, as well as mass-market chains, and online retailers. Enesco plans to close most if not all of the 400 locations of Things Remembered across the country. Things Remembered is seeking bankruptcy court approval for a severance and outplacement program to support impacted employees and incentives for store employees. Things Remembered employees—with their skills, knowledge, experience and continued hard work—remain a critical part of the company’s future as it moves through this process. Women’s clothing store Charlotte Russe also filed for bankruptcy earlier this month but Feder says the Visalia Mall storefront was not on the list of closures. Charlotte Russe Holdings Corporation voluntarily filed for relief under Chapter 11 of the Bankruptcy Code on Feb. 3. As part of its filing, the store announced the closing of 94 stores including locations in La Mesa, Santa Ana, and Irvine, Calif. but said all of its well performing stores would remain open. In fact, Feder said no Charlotte Russe stores will be closing in any of the 168 malls owned by his employer Brookfield Properties. Charlotte Russe is a fashion brand for young women, offering affordable on-trend apparel, shoes and accessories for all sizes, with a fun and engaging shopping experience wherever and whenever she wants. Charlotte Russe operates in the contiguous 48 states, Hawaii and Puerto Rico through their online store and mobile app, as well as over 500 brick-and-mortar stores located primarily in malls and outlet centers. In 2016, the Company expanded to include Peek Kids, operating 10 stores and an e-commerce site. The company did receive approval from the U.S. Bankruptcy Court to continue payment of employee wages and benefits, and amounts due to shippers and warehousemen, utility service providers and taxing authorities. The company also received authorization from the court to continue to honor certain customer programs. In a Feb. 19 release, Charlotte Russe said it will simultaneously seek court approval of a “stalking horse” agreement and that it remains in active discussion with prospective bidders for sale of the business to avoid the liquidation of its assets. Charlotte Russe stated that competing bids will be due by March 3, 2019 and expects an auction will be scheduled for March 5, 2019. In the event that a going-concern transaction is not selected as the highest or otherwise best bid following the conclusion of the auction, the company will facilitate an orderly wind-down of all of its store locations and operations beginning on or about March 7, 2019. The news for Payless, Things Remembered, and Charlotte Russe comes on the heels of last month’s announcement that Gymobree will be closing all of its stores as well as its sister stores Crazy 8 and Janie and Jack. Those stores are set to close before the end of March, depending on inventory. Feder said he expects some of the leases for the vacant spaces to be signed by this summer. Some retail chains are looking for spaces larger than the current square footage per space and may, for the first time, be interested in occupying a combination of spaces, such as Crazy 8 and Gymboree, into a single, larger retail space. Feder said announcing new retailers should also feed into future special events at the Visalia Mall, such as its Taco Challenge on April 27. The mall will also continue its Food Truck Fridays events from 12-9 p.m. every Friday from May 3 through Sept. 27 in the north parking lot of the mall.